Well that was... depressing. Let's all hug it out in the debrief ok? A little group therapy will do the soul good. 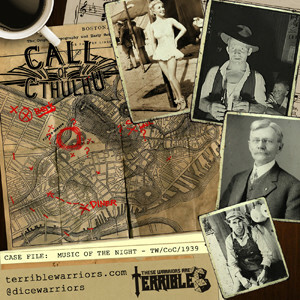 Mike "The Birdman" Dodd, Brendan Frye, Bre Poisonne, Julian Spillane and Justin Ecock comtemplate their existence in the debrief of our Call of Cthulhu campaign "The Music in the Night". "It was the eldritch scurrying of those fiend-born rats, always questing for new horrors, and determined to lead me on even unto those grinning caverns of earth's centre where Nyarlathotep, the mad faceless god, howls blindly to the piping of two amorphous idiot flute-players." H.P. Lovecraft's "The Rats in the Walls"
It's the final chapter in the Terrible Warriors journey through Call of Cthulhu. Jim Peters, the mastermind behind the song that drove our investigators into madness, is dead and all that's left is to obviously walk down a dark cave to face whatever evil force is behind this right? I mean, nothing wrong can happen now... the worst MUST be over. Hold onto your butts. Listen closely as Mike "The Birdman" Dodd, Brendan Frye, Bre Poisonne and Julian Spillane go mad and worse while Keeper Justin Ecock laughs maniaclly and rolls those insanity checks. It's the final chapter of "The Music in the Night", there will be no encore. "There was the immemorial figure of the deputy or messenger of hidden and terrible powers - the "Black Man" of the witch cult, and the "Nyarlathotep" of the Necronomicon." - H.P. Lovecraft's "The Dreams in the Witch House"
Trapped inside Boston's Schillinger House the truth of the music that sent a city mad has been found. Now forces eternal begin to stir and plague our investigators as they rush against time and fate to save themselves from insanity, death or worse. Investigators Mike "The Birdman" Dodd, Brendan Frye, Bre Poisonne and Julian Spillane and Keeper Justin Ecock journey through the third episode in the Call of Cthulhu campaign, "The Music in the Night". "What his fate would be, he did not know; but he felt that he was held for the coming of that frightful soul and messenger of infinity's Other Gods, the crawling chaos Nyarlathotep." H.P. Lovecraft "The Dream-Quest of Unknown Kadath"
Fleeing to Harvard University our four investigators, and unwitting murderers, try to rest the night and plan their next move. But they will be plague by a dark message from a dark messenger. What is the truth behind the song that sent them mad? What secrets does Boston still have for them? It's the second chapter of "The Music in the Night" with Investigators Mike "The Birdman" Dodd, Brendan Frye, Bre Poisonne, Juliane Spillane and Keeper Justin Ecock.